The two tall and slender pillar-crosses standing 15 feet apart are now heavily worn and it is difficult to make out the carvings on them, but they have been dated to around 1000 AD and are Anglo-Norse in origin. Both crosses have sustained some damage – the taller cross with a badly damaged head is between 11 and 12 foot high, while the smaller cross, also without its head is between 10 and 11 foot high. Set between them, spaced 2 feet apart, and embedded into two long slabs are four hogback gravestones with curved upper edges and some rather nice carvings, including spiralling and circles with crosses or interlacing inside them. These graves represent Viking houses with carved sections depicting the life of the person(s) buried beneath them, often with intricate symbols and patterns; the stones here may represent four wild boars killed by king Owain in Inglewood Forest. Close by stands the Giant’s Thumb which also commemorates Owain Caesarius who was a legendary, perhaps mythical, king of Cumbria from 920-937 AD. This 6 foot high monument is another pre-Conquest cross with part of its wheel-head now missing. It stands upon a 19th century Victorian base with an inscription. According to local legend, the cross was set-up at the time of Owen’s accession to the throne of Cumbria. However, some historians have argued that Owain or Ewan was, actually, Owain ap Urien the son of king Urien of Rheged in the 6th century AD, who was probably of Welsh/Irish descent. Rheged was a part of the old north country, known to the bards as Hen Ogledd, which covered a large part of northern England and southern Scotland, in particular Rheged was centred on Cumberland and Westmorland, its people speaking the old Brythonic language. King Urien of Rheged ruled from 550-590 AD. 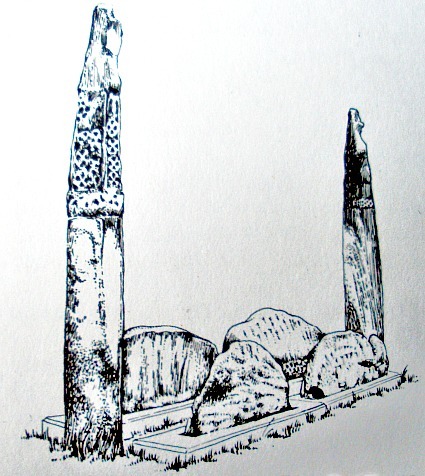 Categories: Ancient Crosses, The Giant's Grave | Tags: Ancient Crosses, The Giant's Grave at Penrith in Cumbria | Permalink.